Come February and the heat builds up both in terms of illnesses as well as the onset of summer. Charan Teja, 18 months was brought to the health centre with complaints of failure to thrive. 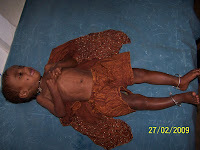 Looking at him Dr Ramesh felt that it was MARASMUS (Protein Energy Malnutrition). However, since there was a history of Urinary Dribbling, we thought of Chronic Urinary Tract Infection, due to Postr Urethral Valves and Septicemia. Parentaeral antibiotics were given and he was referred to St Johns Medical College, where the latter diagnosis was confirmed. He is at present admitted at SJMCH and surgery has been planned once his Urinary Infection comes under control. This young 19 year old girl came to us because of delayed as well as irregular cycles. 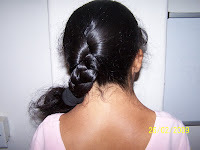 Dr Kamakshi made the diagnosis of TURNERS SYNDROME since she is short statured as well as has neck webbing.